SwordSearcher is a powerful Bible study application, featuring numerous resources and unique features - far more than just an electronic concordance. Resources include several commentaries, dictionaries, maps, illustrations, and topical guides. Features powerful searching and many useful time-saving tools. Supports user-created content. Pop-up verse references allow instant examination of cross-references in resource material. Pop-up Strong’s definitions immediately show Strong’s Lexicon definitions over King James Bible Strong’s Links. The Topic Guide allows quick indexing of all dictionaries, topic guides, etc, on a particular topic or verse. “Deep Referencing” links all relevant material to verses, alleviating the need to guess at relevant dictionary or topical entries. 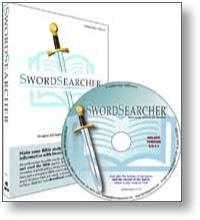 SwordSearcher has a host of features and resources for improving your Bible study. It is a Bible concordance and so much more. Over 1 million cross-references combined. 14 Bible texts, 8 dictionaries and encyclopedias, 14 commentaries, 4 topical Bible guides, 4 other books, and over 360 maps, charts, and illustrations. -- “Deep Referencing” links verses to every resource available. Not only are commentaries tied to verses, but now other books are too - topical references, dictionaries, encyclopedias, etc., are all accessible directly from the verses they reference. No more searching for topics or dictionary headings that might be relevant to the passage you are reading - SwordSearcher puts it all a click away. -- The Topic Guide is the fastest way to see what every resource has to say about a particular topic or verse. Want to study Aaron? Tell the Topic Guide, and it will show you entries in every resource available. Want to know everything said about John 3:16? Just type the verse reference into the Topic Guide, or right-click the verse in your Bible display - and it will show you every reference from every resource that mentions it. -- Instantaneous Bible Searches immediately show you every verse resulting from your search parameters. Full context reading on any verse is just one click away. Search the KJV for Strong’s numbers/links too. -- Pop-up verse text means you are not forced to move your Bible reader to a new verse just to read a cross-reference. Just hold your mouse over a reference to a verse, and it is displayed immediately. Move your mouse away, and it’s gone. Click on the reference to read the entire context. -- Pop-up Strong’s definitions - just hold your mouse over a Strong’s Lexicon link in the KJV with Strong’s Links to see the definition. Click for further examination. -- Extremely efficient clipboard functions. Don’t bother marking verse text with your mouse to copy it to the clipboard. Just right-click for your choice of automated verse copying methods for that verse or from that verse to another. Customize how the verses are formatted. You can still mark text with your mouse if you want to, and you can manually enter a verse or list of verses to copy. -- Simple Interface. It’s amazing that a simple interface is the best way to access a myriad of functions, and SwordSearcher is built on this design philosophy. You won’t get lost in a deluge of opening windows here. -- Create your own material. It’s easy to jot down your own notes in SwordSearcher. Record your thoughts commentary-style or by topic - or both. Already own SwordSearcher? Order the modules only. See #3 below. Way of Life modules on disk. Note: The Way of Life Encyclopedia is also available for Bible Analyzer in the Bible Analyzer store. * The Bible Analyzer store is not affiliated with Way of Life Literature.